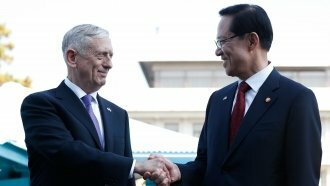 Mattis' trip was the first by a Pentagon chief in over 15 years. U.S. Defense Secretary Jim Mattis visited the U.S. Navy base at Guantanamo Bay, Cuba. His trip was the first by a Pentagon chief in over 15 years. Mattis arrived Wednesday and met with troops. The Associated Press reports he didn't tour the detention facilities or discuss detainee policy. The latter of which makes sense — we don't know what the Trump administration will do with Gitmo. Former President Barack Obama reduced the number of detainees and tried to close the facility, but Congress stymied the effort. President Donald Trump hasn't really made moves in any direction. U.S. Attorney General Jeff Sessions visited the facility in July, and he's previously called it a "perfectly acceptable" place to hold detainees. There are currently 41 inmates still housed at Guantanamo.